The Greenbelt Guardians celebrated our 16th anniversary on Saturday March 02 by participating in the Austin Parks Foundation’s annual spring “It’s My Park Day” event. 62 volunteers worked at the Gus Fruh entrance from 9AM – 1PM and put in a total of almost 200 hours of labor! We resurfaced 500 feet of the switchback entry trail, from the main trail along the creek up to the first, level switchback at the top. We used 12 tons (about 10 cubic yards) of decomposed granite mixed with StaLok stabilizer and a couple of yards of road base. The materials were moved down the trail one wheelbarrow at a time, spread and raked out by hand, and then compacted with plate packers and hand tampers. It was quite an undertaking, but we had a great group of volunteers, good weather, and we had the materials delivered ahead of time to avoid the problem we had back in November, when 45 volunteers were ready to spread granite that didn’t show up! Things went smoothly this time, the trail work turned out well, and we were also able to do some work on the lower trail and steps along the creek. Please check out the photos here. We hope to schedule another smaller workday in late April to finish resurfacing the trail all the way out to the street. In addition to our regular volunteer workdays, the Greenbelt Guardians also raise funds to contract for the removal of invasive plants on the greenbelt with organizations that are authorized to use tools (chainsaws and herbicide) that volunteers are no longer allowed to use on city park land. We spent $24,000 in February and kept a crew from the Texas Conservation Corps busy for 4 weeks removing large amounts of ligustrum, nandina, and other invasives along the creek between the Spyglass and Gus Fruh entries. As always, we’ve stopped our invasives work for the spring and summer due to federal restrictions on the removal of vegetation in protected areas where the endangered golden-cheeked warbler might be nesting. We’ll resume this work in the fall and are planning to spend another $25K then on more TxCC contract labor. The creek is about dry, but everything is blooming and the greenbelt is really beautiful right now, so please get out and enjoy it soon if you can. See you on the trail! In April, our leadership team finally got together when we weren't working to celebrate the 15th anniversary of our first workday back in 2003. We usually end up hot, tired, dirty, and hungry when we see each other, so it was nice to just hang out, relax, eat, drink, and enjoy each other's company for a change. On June 02, National Trails Day, five of us spent a hot and humid morning working at the Gus Fruh access. 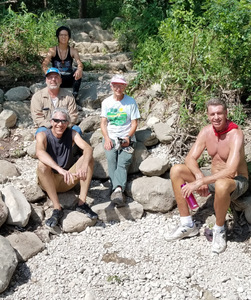 We got an amazing amount done including building a new set of rock steps to connect the Gus Fruh access trail to the Violet Crown / main greenbelt trail on the far side of the creekbed, and closing off the dirt / mud hillside next to it that was previously being used. We moved a lot of flood debris, gravel, rock, and brush that day, and it really looks good and works well, Please get down there and check it out when you have a chance. Many thanks to Rosalie Russell, Mark Stachew, Nathan Wilkins, and Mark Salinas with Parks and Rec - you guys rock! We plan to lay low again this summer during the worst of the heat, but hope to organize another mini-workday or two at Gus Fruh to build a few more steps on this side of the creek with some more of the donated stone that we have stockpiled. Our next major workday will be on Saturday September 29, National Public Lands Day. Then on Saturday November 03, we'll do another big project for It's My Park Day - Fall. Stay tuned for upcoming information on locations, times, and sign up. We came into being due to the love of a dog and the lack of a fence. 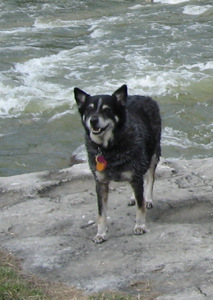 Those variables translated into daily walks in the neighborhood with the dog, and the discovery of the Homedale entry into the Barton Creek Greenbelt. It was a bit like Alice in Wonderland, finding this lovely natural Hill Country landscape with the episodically flowing creek. For someone who grew up on a dry land farm during the midst of the great drought, this was paradise. But it was a paradise that was experiencing neglect and occasional abuse. My professional landscaper eyes saw the intrusions of invasive foreign plants, and drainage and erosion challenges to the dirt trails, and trash, and even old car disposals. I began inquiring at the Austin Parks Department to see if and how volunteers might participate in maintaining the trails, and worked with then BHNA President Robin McKeever to establish how we might engage our neighborhood in the work required. She suggested that we set up a committee under the Neighborhood Association that would organize and oversee volunteer greenbelt trail work days. That committee became the Greenbelt Guardians. We worked with The City of Austin Parks Department to set up a formal adoption agreement in March of 2003, for the sections of the greenbelt that fall within the Barton Hills neighborhood: from the Zilker park trail entry starting below the Barton Creek dam, to the Homedale and Spyglass entry trails, to the Gus Fruh entry trail ending at the Highway 360 trail entry. For two years we had small work days with volunteers recruited through our Barton Hills Neighborhood Association website and newsletter. A steady core of dedicated volunteers showed up, and became the leadership team of our quarterly workdays. In 2005, we got a small grant and began working as a park adopter under the fiduciary umbrella of the Austin Parks Foundation, which offered small grants to groups that engaged in park improvements. Since that time, we have been fortunate to obtain grant funds from some private donors for habitat restoration, plus a grant from TCEQ (Texas Center for Environmental Quality). We have also collaborated with the Austin Parks Foundation on the execution of privately funded activities to improve environmental integrity and trail improvement activities. As the city has grown, so has the use of the greenbelt, as a refuge from urban stresses. In response to these pressures, a larger, collaborative response has been created to assure that our precious greenbelt and publicly accessible natural lands are protected. More information to come in our next newsletter about the larger collaborative efforts for expanding and managing what is known as the Violet Crown Trail.